On to NYC! Nighttime is so full of energy in NY. The lights, sounds and activity can’t help but stimulate the creative mind…so much to take in. The only thing I was ready to do when we arrived at our hotel at 12:45am was to locate the bed and catch some zzzzzzz! After several hours of sleep I was glad to be starting DAY 1 in NY. Zylo was the place for breakfast with my awesome Uncle Dwayne. this is home for great pastries and cakes! 🙂 After time at my uncle’s place and thoroughly enjoying Adelle music and conversation, we headed back to the city for the night. 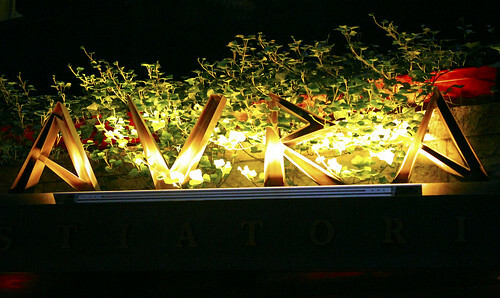 Avra was the restaurant of choice for dinner. Our favorite Greek food in NY! Amazing spanakopita, taziki spread and unreal roasted potatoes (hint of lemon)!! It’s no wonder we ate there 3 times during our stay in NY. 🙂 With full tummies it was off to bed to rest for a big day on Friday. to hit the streets of the Fashion District for some much anticipated fabric shopping. With design ideas in my head, I was going to allow the fabric to inspire me in my design process for this next collection. First, I set out to hand select fabric and lace for a custom design bridal gown that I have been thrilled to be a part of. Now, this gown is not just any bridal gown. It is to represents character, tradition and uniqueness to the one wearing it. This gown will be worn by Girl’s Preparatory School May Day queen Rachel Kelly…a most amazing young woman who was chosen by her peers to hold this title because of her richness in character, service and a spirit that is truly inspiring to all she meets. This design represents her sweet & humble spirit, her amazing voice and her graciousness. I am so excited about this dress! Next, I was off to find just the right fabrics for my next collection. First store, almost all fabrics found! Not bad, but I love these fabric stores in NY so, off to look for more. It was in MOOD fabrics that I found the last fabrics for my collection. Let’s just say Chanel inspired with bold modern elements. 🙂 Love, love!! One more stop for the day. Ms. Brenda - fantastic customer service! Thanks! Wonderful individuals that I met who have just been incredible to talk with and learn from. Thanks to all of you!! The Edamme Dumplings are to die for!!! After dinner & some time in Chelsea Market – Anthropology (more on that later) – we made our way back to the hotel to call it a night. Sleeeeeep! So far my first 2 days had been great. What next? Time with my family. 🙂 So, after brunch at Avra 🙂 we spent the day at the Natural History Museum. Any “Night in the Museum” fans out there?! Unbelievable museum, so much to see, not enough time. Quick change and off to meet up with our dear friends Ms. Catherine & Ms. Carol. Every year my parents connect up with these ladies for the Westminster Dog Show and when my sister & I have been lucky enough to make it to NY for the show we get to visit them too. Fiorello’s was our dinner spot for Day 3. It is great Italian dining across from Lincoln Center. Miss Catherine, a native New Yorker & proud of it 🙂 introduced us to this great spot years back. It never dissappoints! What a tasty dinner…now across the street to the world famous Lincoln Center for an evening with the New York City Ballet Company. Okay, here I am in NYC and have just watched a great ballet, coming down the stairs into the lobby and lo & behold…WHAT? ?…it was my fellow GPS girls!!! And, my dance ensemble instructor Ms. Kashe and my sister McCall’s instructor Mrs. Zahrobsky too!!! How crazy is that?! It was awesome…it truly is a small world & no matter where I go this amazing community of “sisters” I find…fantastic!